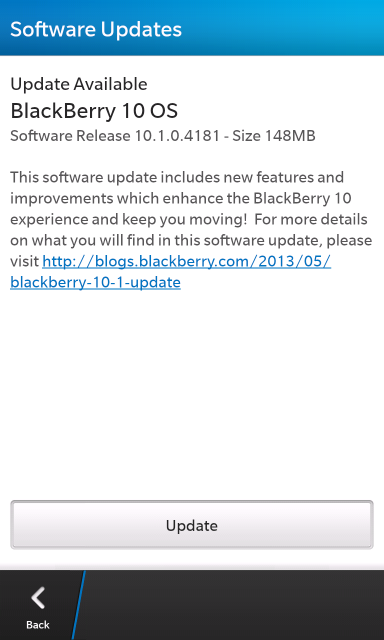 If you have a BlackBerry Q10 or Z10 in EMEA, you should receive an upgrade notice for an OTA update. If not, go into Settings/Software Update. There is a new way to get to the next or previous message on the Z10. Swipe to the right until the message list shows up on the left and then either up or down. For the Q10, there is a new keyboard shortcut U to get to the newest unread message. Folks in the US will need to brace themselves until the end of summer. Verizon customers just got the initial 10.1 release. Well, I uploaded the latest version and I "hate" it. The HUB is splited now into Private and Business and the Business part doesn´t show anymore SMS for example, only the company Email is shown. the Hub split into private and work is an optional IT policy. On my Z10 the Hub is unchanged after installing MR1 and I am using BB balance as well. It depends on your IT whether they enforce BB balance to split the hub. I agree with you and would also find the hub split annoying if it were imposed.